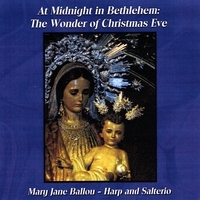 Sample music from Mary Jane Ballou’s CD’s and purchase online. Arrangements of music for harp and for a cappella women’s voices will soon be available. Carols from around the world, as well as a hymn from Iraq and a lullaby from China. Old favorites share the stage with some you’ll learn to love. Recorded Celtic harp and 118-string salterio, this is music for peaceful moments. A mixture of tenderness and joy to bring you closer to all you love about this season of delight. 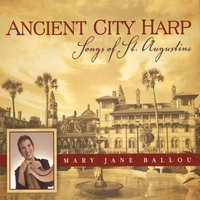 Celebrating over 400 years of music in the Nation’s Oldest City, St. Augustine, Florida, Ancient City Harp is perfect for unwinding and relaxing. Imagine yourself walking down cobble-stoned streets or riding in a horse-drawn carriage along the Bayfront. Maybe you’re rocking on the front porch of your bed and breakfast after a trip to the beach or visiting the 17th century fort. Ancient City Harp will sing just the right songs for your spirit. Listen to MORE sound clips at CD Baby!